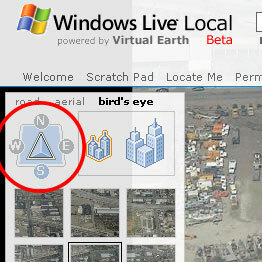 Looks like you can actually rotate the “Bird’s Eye View” in Live Local, but you don’t always have all the options. If we look at the ESRI campus example, you can see we only can rotate the view 180 degrees. If you want to look at a more popular landmark you can see how you may rotate the view 90 degrees. Of course as I’ve said before, I don’t have any Bird’s Eye Views in my neck of the woods so your mileage may vary and of course this doesn’t help with moving from one image to the next.